International Trombone Festival 2012: Where are the Women? 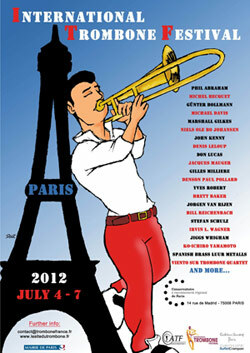 The International Trombone Festival will be hosted by Jacques Mauger in Paris, France this summer. What a lovely place for such an event! Too bad M. Mauger failed to invite a single female artist to the festival. Of the 42 artists that were invited, all are men. Of the 9 composers that were invited, all are men. Not only is this in inaccurate representation of the current trombone demographic across the world, but it is also incredibly insulting to all female trombonists. Quel dommage-What a sad situation. As a female harpist, I have been aware of the plight of the few but excellent male harpists in my world. We always balance and include them in all our world congress and harp society concerts. Your instrument is not adequately represented by only having men perform in Paris. And I flew across the world to hear my son perform bass trombone this week; now I want to “boycott ” I mean GIRLcott the entire festival. The festival poster also exhibits a male gender-based bias and should be removed from the website for the festival. It would be like portraying all harpists as blonde, long haired females in flowing gowns. Get with it Mr. Mauger! Women are 52% of the planet.